What does the Quarterly Borough Utility bill include? Dublin Borough bills for Trash at the rate of $71.54 per quarter, Sewer at the rate of $165.00 per quarter, and if you have water service through the Borough, the fee is a flat Base Rate of $25.00 per quarter plus usage, which is billed at a rate of $3.70/1,000 gallons. When are the Utility Billings? Dublin Borough bills for utility use quarterly. Bills are send out in January, April, July and October and will be issued on the 15th of the month and due the 15th of the following month. When are late fees applied? Any payment that is NOT received by its due date is considered late and a 10% penalty will apply to the outstanding balance monthly until the bill is brought current. If an account remains delinquent, penalties will continue to be applied as per Ordinance 309, that was adopted by Borough Council September 12, 2016. You can make your payment at Borough Hall, Monday - Thursday 8:30 a.m. to 4:30 p.m., by dropping off at the lock box located outside the entrance at borough all, or you can make a payment online. Residents and property owners can pay utility bills using Visa, MasterCard, Discover or American Express online. There is also an option to pay with an E-Check online ONLY. 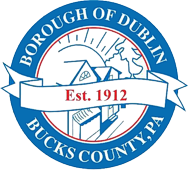 Checks are made payable to Dublin Borough. There is a Convenience Fee of $4.95 per transaction with a maximum payment amount of $600.00. Balances more than $600.00 can make multiple transactions with an additional Convenience Fee applied with each transaction. There is no maximum payment amount for the E-Check service. The $4.95 Convenience Fee is a processing fee charged to the user for the service and is not collected by or received by Dublin Borough. Residents and property owners can also pay utility bills and permit fees with a Credit Card in Borough Hall during normal business hours at 119 Maple Avenue. The E-Check payment option is not available at Borough Hall, it is only available online. What if my water bill seems high? The sound of a running toilet…it can keep you awake at night. If your toilet is running constantly, you could be wasting 200 gallons of water or more every day. (US EPA Water Sense) Not only is that running wasteful, it can also be expensive. When the toilet runs, it means the water is flowing into the tank or bowl and not stopping. Either the toilet runs and never stops, or it stops for a while and then starts again without the help of a flush. Is it the Handle or Lift Chain? •	Check the mounting nut for the handle on inside of the tank. It may be sticking and not letting the handle get back in the right place when it’s let go. If that is the case, simply clean it. •	Check the chain to make sure it doesn’t have too much slack. If this happens, it can get caught under the flapper, causing water to leak down into the toilet. •	Check to be sure the chain isn’t broken. Often these get corroded or just weakened over time and break apart. Replace this with a new one so it hangs straight with about a 1/2″ in slack. •	If you don't have a chain in your tank, check to be sure your lift-wire isn't bent. If it is, try straightening it out until the toilet operates smoothly. If you're still not sure or are unable to fix the leak yourself, it might be time to call a plumber! Does the Borough offer ACH (Automatic Payments)? Yes! You can complete the form, and the Borough will automatically deduct your payment directly from the Account information you provide. Who is responsible for maintaining the curbs and sidewalk at the front of my property? The curbing and sidewalk are the responsibility of the property owner. Is a permit required to replace / repair my sidewalk and curbing? Yes, a permit is required along with an inspection before the concrete is poured. All applications and concrete specifications can be found under the Forms and Documents section of our website. Does the Borough inspect curbs and sidewalks throughout the Borough? In preparation of a Road Paving Program, the Borough Engineer will inspect curbing and sidewalks on the road that is to be repaved. If deficiencies are located, the Borough will notify the resident in writing about the repairs needed. What is required for Residential Resale? The Seller has to request a Utility Certification from the Title Company and they also need to have a Sewer Lateral Inspection Completed. Is a permit required when moving into the Borough? Yes, a Moving Permit is required when moving into the Borough along with a $35 fee. Am I allowed to have chickens on my property?